Over the past week or so a small controversy has broken out over my article criticizing Thomas Woods' two lectures given at the Mises Institute in 2002 and earlier this year. Mr. Woods then replied to me, and as I was away for nearly two weeks, I am belatedly replying again to Woods. Unfortunately I will largely have to repeat myself, since Woods did not choose to actually engage my arguments, but rather largely ignored them. 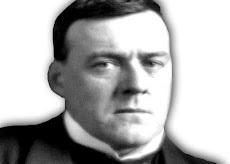 The main point I made in my criticism of Woods was that as a Catholic, in fact a Catholic who has made a point of claiming special loyalty to the traditional Magisterium of the Catholic Church, Woods could hardly dissent from the teaching of that Magisterium without creating a contradiction. I refer the reader to my original article for ample citations to the effect that the Popes, whether Thomas Woods likes it or not, have in fact taught authoritatively in the area of economic morality. I find it astounding that Woods can claim they had no right to do so, as they, presumably, were well aware of the issues involved in such teaching, and in fact addressed the very question of the legitimacy of such teaching more than once. Woods opines that these papal actions are akin to the Popes telling an architect of a church building what materials or building techniques would be best to use, since such an action would involve a judgment about architecture, which is beyond the competence committed by our Lord to his Church. So with economics, Woods asserts, it is beyond the competence of the Magisterium to make the kinds of statements it has made about economic morality. All the Popes can do is to state broad goals - "the workingman and his family to be prosperous" - and then let economists figure out how to achieve that goal. But the two cases are not parallel. Why? Because economic actions are intimately involved with ethics. When Leo XIII teaches in Rerum Novarum that a free agreement between employer and employee is not sufficient to guarantee the justice of a wage, since "there is a dictate of nature more imperious and more ancient than any bargain between man and man, that the remuneration must be enough to support the wage-earner in reasonable and frugal comfort," he is making a moral judgment, although it does indeed touch on economics. It bothers Woods that Pope Leo would say such things. 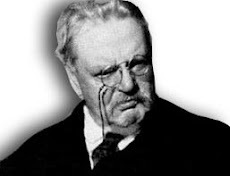 When I pointed out that if a sociologist or a psychologist were to claim that their sciences trumped some teaching of the Church, we would certainly reject their claims, Woods, amazingly, replied, that contrary to a sociologist making a claim on behalf of abortion, "there is nothing intrinsically immoral about a worker and an employer reaching an uncoerced labor agreement." This is amazing, because Woods is assuming the thing he wants to prove. For Pope Leo asserted that there was indeed something "intrinsically immoral" about such an agreement if it did not provide a sufficient wage for the worker to live on. Moreover, and more importantly, notice that Woods says "there is nothing intrinsically immoral" about a totally free wage agreement. Is not this a moral judgment? It is hard to see how economics, whether Austrian or otherwise, could pronounce about the morality of anything. So perhaps, without noticing it, Mr. Woods has strayed into the domain of morals, which is exactly what I claimed from the beginning. Toward the end of my article I pointed out some economic facts which tended to disprove Woods' doctrinaire attitude toward Austrian economic theory. This part of my argument Woods ignored altogether. But, to take Woods own example, what worker would ever reach an "uncoerced labor agreement" that did not provide him with enough to live on? The fact of the matter is that the supposed freedom provided by free-market capitalism is a pseudo-freedom. Those with economic power will dictate to those without economic power. "Work at this wage or starve." This is the kind of "uncoerced labor agreement" that Woods champions. 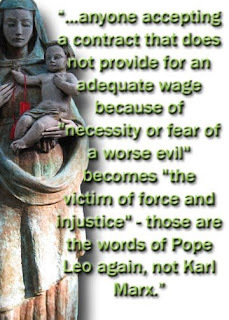 But in fact, anyone accepting a contract that does not provide for an adequate wage because of "necessity or fear of a worse evil" becomes "the victim of force and injustice" - those are the words of Pope Leo again, not Karl Marx. And there are types of economics which recognize these facts, such as Institutionalism, an economic school which analyzes the economy in terms of legal, social and economic structures and institutions. But since Woods hardly replied to anything I actually wrote, I will say nothing more and leave my original article as his best refutation. When he replies to my points, both those about ecclesiastical authority and those about economics, then it will be time to say more. One final note. Mr. Woods, I understand, is a convert. That is all to the good, and I am a convert myself. But perhaps when Mr. Woods was being instructed in the Faith no one thought to tell him that it is the Church herself which sets the limits to her teaching. Perhaps no one told Mr. Woods that he had to give up his habit of private judgment and simply accept all that the Church believes and teaches. It was formerly the glory of Catholics that upon submission to the See of Peter we accepted the teachings of the Magisterium. No, we did not abandon our intellects, but we recognized in the voice of the Church the voice of One whose words were always those of eternal life. The logic of a Catholic dissenter, such as Thomas Woods, is impossible. He has confered the charism of infallibility on Austrian economics, and he himself admits, indeed proclaims, that papal teaching and Austrian economics do not agree. But his difficulty is simply that of many another man who refused to abandon his private judgment. In the past, in the days before the Second Vatican Council, days that Mr. Woods claims he would like to see return, the Magisterium would have made short work of his dissent, if it had ever heard of him. Submit or be excommunicated. The choice has been offered to many another dissenter and heretic throughout the history of the Church. I myself long for those days, for the restoration of authentic and traditional Catholic praxis. But if ever we should be blessed with such a restoration and genuine renewal, I fear that Mr. Woods will have asked for too much. 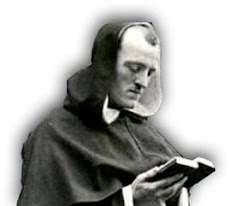 For he would be among the first to feel the healthy discipline of a teaching Church that enforced her doctrines on her members and actually required Catholics to conform their lives and opinions to Catholic teaching.